15) I was a Catherine Wheel! I had been chronically ill for a long time when I went along to my first ever healing evening at a spiritualist church. I had absolutely no idea what to expect and only went to accompany a friend. I thought that as it was at a church we would all sit in rows, someone would talk to us about healing and that we might sing a couple of hymns and say a few prayers. I had no knowledge of healing, spiritual or otherwise, and didn’t expect the evening to be particularly special or eventful. So I was surprised, when instead of rows, the chairs were just dotted around the room, and as we walked in I was asked where I would like to sit. I just chose the closest chair and felt a bit odd just sitting there, with no idea what was about to happen. After a few of us had taken our seats the person in charge then allotted a healer to each of us. A very old lady with a gentle smile came and stood beside me and introduced herself as Jeanie. She explained that she was a student healer but that everything she did would be overseen by the woman in charge. I immediately felt at ease and relaxed and just thought to myself that her healing may do some good and certainly wouldn’t do any harm. The lady in charge said the most beautiful prayer and soft spiritual music was played. The room then became quieter and everyone spoke in hushed tones. Jeanie stood in front of me and asked if I minded her holding my hands, which I said I didn’t at all. She looked straight at me and said “I shouldn’t really be telling you this but I am sure I have your Dad with me,” she went on to give a detailed physical description which exactly fitted him. She told me that when she was healing she shouldn’t really be connecting to a spirit, but felt that she had to tell me my Dad was there because she felt his love so strongly. Then she said something that I will never forget. She said “he is telling me to tell you that if his love could cure you, you would be well”. I was stunned, and desperately trying not to cry as they were the exact words that my Dad had said to me the previous summer when we had sat in my garden. He had held my hands and told me he loved me and said that if his love could cure me I would be well! I had been pretty certain that Dad was there because of Jeanie’s description, but that message just blew me away. No-one would have known that Dad had said those very words to me. I knew how upset both he and Mum had been seeing me so ill and feeling so useless at not being able to take away my pain, all they felt they could do was show how much they loved and cared for me. Jeanie walked behind me and asked if she could then place her hands on my shoulders, which I said was fine. She said if I wanted I could close my eyes. I remember feeling quite overwhelmed by her message and then felt total peace as I closed my eyes and just listened to the music in the background. The next thing I knew was that I was not aware of my body at all, it was the oddest sensation, I felt so light and like I was floating. I tried to feel my feet on the floor, but it was like they didn’t exist. All I could see was the colour green, a bright vibrant green, like a fresh leaf in springtime with the sun streaming through it. I was surrounded by it, enveloped by it and strange as it may seem, it was as if I was it. I felt like I was a disc at the centre of me and I was spinning round and round. The spinning became faster and faster and faster, all I can really say it that I was, or became, just pure and utter bliss. 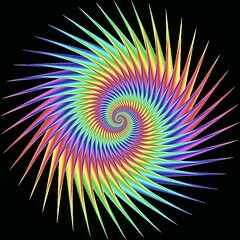 I tried to work out what I was and all I could come up with was that I felt like a Catherine wheel! I was unaware that I had slumped forward in the chair and the next thing I knew was that the lady in charge was asking me if I was alright. I felt dazed, and to be honest, almost a little annoyed to be bought back from ‘Blissville’. Jeanie later told me that it was the most profound healing session for her. She said she had never felt so much love coming through her. I felt elated knowing that my Dad was there for me. It was only several months later when I first started to learn about chakras that I was surprised to read that chakras are discs that spin, sometimes described as energy vortices throughout the spiritual body. The heart chakra is normally green and is often associated with love and healing. Now, when I meditate I sometimes visualise my chakras, working my way from the base chakra upwards through my body, and I always smile when I get to my heart chakra, because to me it will always be my very own Catherine wheel! Previous 14) We’re experimenting! Next 16) I’m going to post a blog a day! A hundred thousand times to say how much I’m honoured to have you as my twin! You are a selection box of spiritual fireworks! Pass me a sparkler, lovely lightworker!